Put minced meat into a deep bowl and add seasoning. Mix well to combine. Add spring onion. Heat olive oil in a non-stick saucepan. Sweat the white mushrooms for a minute. Add the beef and fry briskly until meat is cooked through. Dish out and set aside. Microwave each piece of tortilla on Medium High for 10-15 seconds. Remove and place on a flat plate. 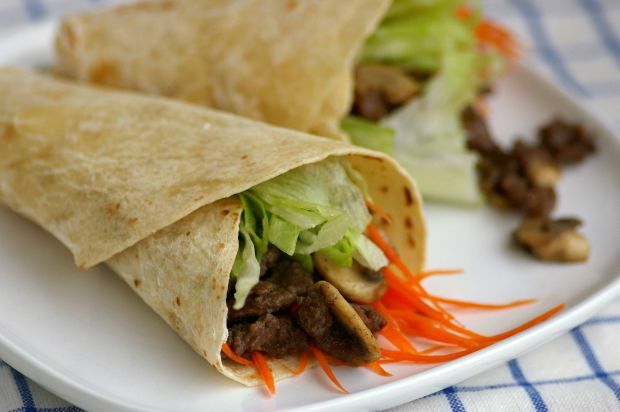 Layer with a whole leaf of iceberg lettuce and 1-2 tablespoons of beef mixture. Add a little shredded lettuce and carrot. Wrap neatly and serve immediately.